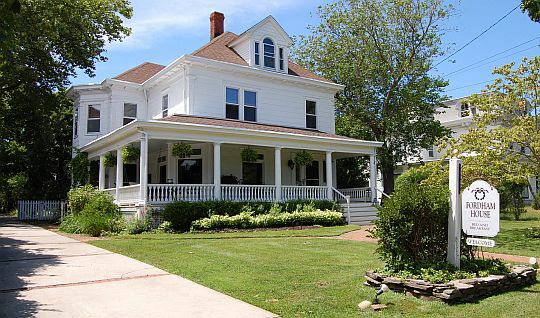 Here's a convenient guide to the Greenport bed and breakfasts to help make planning your visit to this beautiful town a little easier. I've included a picture and description of each one and where possible a video as well. With it's salty charm and close proximity to the wineries the village of Greenport on Long Island's North Fork is one of our most popular travel destinations. 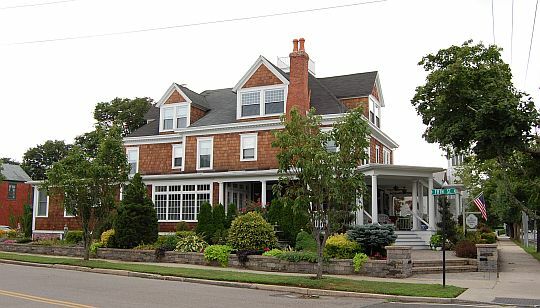 Staying at one of it's 7 bed and breakfasts is an excellent way to experience Greenport's rich maritime history, outstanding restaurants and boutiques, and of course Long Island's very fine wine. Like hops? There's a brewery here too! With so many to choose from it should be easy to find a bed & breakfast that suits your needs and style. Some are quiet and solitary while others encourage a party like atmosphere, and most fall somewhere in between. They're all good, so you really can't go wrong no matter which one you choose. Read the descriptions, watch the videos and have fun! 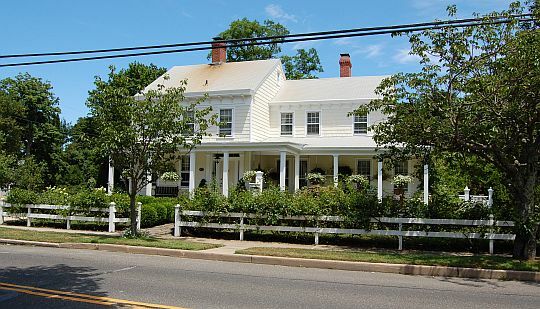 The Bartlett House Inn Bed & Breakfast is the largest B&B on Long Island's north fork. Located on Front Street near trains, ferries, and the heart of Greenport The Bartlett House is popular with business travelers as well as vacationers. The 10 beautifully furnished rooms feature flat panel television, wireless Internet, and very comfy mattresses. Two of those rooms comprise a suite and share a common bathroom. The building and grounds have been lovingly restored beyond their former splendor by owners Jack and Diane who acquired the property in 2003. Diane's talent as an interior designer and artist is apparent throughout the handsomely appointed house. The house features a wrap-around porch and fireplaces in the living room and master bedroom. The porch is the perfect place to share a drink in the shade on those hot summer afternoons while the fireplaces perfectly compliment the crisp Autumn air. Built in 1901, this stately historical Inn reflects sophistication and refinement among the original stained glass windows, woodwork, with luxurious high-end furniture. 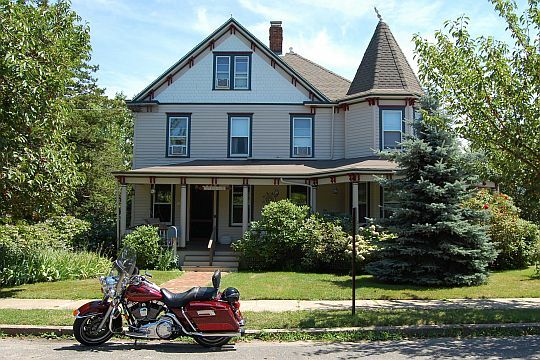 This romantic bed and breakfast is in the Greenport's Historic District, a residential area of tree lined streets, picket fences, colorful gardens, and elegant homes. Beautiful beaches, wonderful shops, ferries and excellent restaurants are only a short stroll from the Fordham House. Each morning enjoy a carefully prepared seasonal gourmet breakfast served at your own table for two. In the afternoon, enjoy a cool beverage and treas on the lovely wrap around porch, or among the spacious garden. The spacious bedchambers are surrounded in a peaceful atmosphere of timeless elegance and romance with luxurious linens. 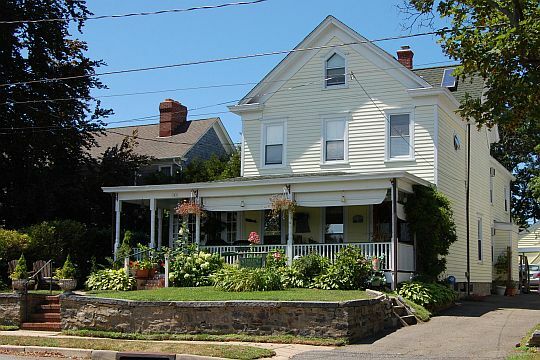 This 5 room bed and breakfast located on Greenport Harbor is just a short walk from the heart of Greenport and is Greenport's only waterfront bed and breakfast. The grounds feature a private beach, small fishing pier, and offer stunning views of Shelter Island. The beautiful English flower gardens are the perfect spot for reading, conversation, contemplation and restoration. 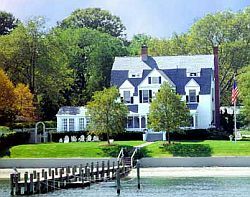 Harbor Knoll's 5 rooms, each with personalty all their own, offer television, water views, garden views and privacy. The 19th century house has been impeccably preserved and for the past 30 years has been owned by the Miller family who's British, American and Irish heritage is reflected in the home's furnishings and decor. Harbor Knoll's many gathering rooms offer the opportunity to socialize, or not. You can enjoy wonderful water views in the beach front porch, a mid-afternoon respite from the heat in the summer drawing room, or get lost in a good book in the well stocked library. No matter how you spend your time at Harbor Knoll, time on the water is always time well spent. 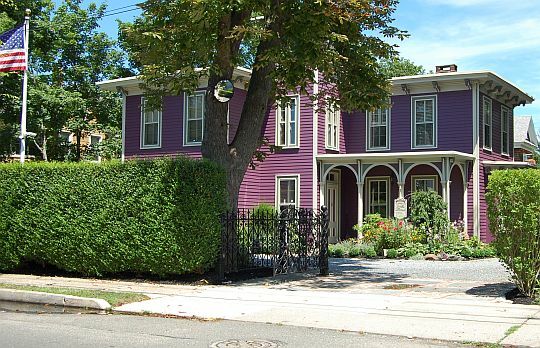 This charming, early 19th century house is the home of The Morning Glory Bed and Breakfast. Run by Klaus and Renate Wilhelm who are originally from Föhr, one of the North Frisian islands off the coast of Germany, The Morning Glory gives you the chance to enjoy a relaxing vacation with a touch of European charm. The Wilhelm's passion for life is evident throughout the Morning Glory and rooms with names like Love Deeply and Laugh Out Loud reflect their loving nature. The Morning Glory's 3 rooms offer flat screen TV, wireless Internet, air conditioning and private baths. A full breakfast with a hot entrée is served each morning which guests can enjoy in either the stately dining room or garden patio. Located only about 1/2 mile north of Front Street, the Morning Glory is just a short walk to all that Greenport has to offer. This picture simply does not do justice to this stunning 5 star bed and breakfast. Ruby's Cove is a fully restored early 19th century home furnished with family owned antiques and other period pieces. All 3 "sleeping parlors" offer air conditioning, queen size beds, private baths, and ceiling fans. A full breakfast is served daily in the spacious formal dining room where guests enjoy homemade breads, muffins, pancakes and other delights by candlelight. Beverages and snacks are available 24 hours/day. Ruby's Cove features 2 fireplaces, a nicely stocked library, a keeping library, and is just a 1 block walk to town. Here's a bed and breakfast located in the heart of Greenport that offers stunning views of the harbor and an easy walk into town. At Stirling House you will enjoy delicious breakfasts by Chef Clay Sauer, wireless Internet throughout the building, and breathtaking water views from each of it's 3 rooms. All rooms also offer private bath, air conditioning, television, and iPod stereo. If you're a musician you might enjoy playing the restored 1880 Chickering piano in the music parlor. For the rest of us, the wrap around porch is a great place to enjoy breakfast while observing the harbor, or to soak up some afternoon shade. Although Stirling House is just a short walk from town, it is located well off the beaten path in the historic district. Surrounded by old Victorian homes on a quiet street, your stay here will be easy and relaxing. And you're in good hands too. After all, Stirling House is Greenport's longest running, continuously owned bed and breakfast for a reason. There's no question that the Wells House Bed & Breakfast is one of the most beautiful B&B's in town. Serenity, privacy, and museum quality antiques in a fully restored sea captain's home is what you will enjoy here. And, it's just a short walk down scenic Main Street into the heart of town. Host Vince Albert spares no effort in making your stay as soothing and detached from the pressures of life as possible. There are no televisions in this house, no children under 21, and no pets. Occupancy is limited to two couples only, and the property is lined by 81 trees for additional privacy. Rumor has it that Vince's home cooked breakfasts are hearty and delicious. Walking times were calculated to the corner of Front Street and Main Street using the average walking speed of 2.5 mph. Ratings were compiled from various sources. Prices are from each B&B's website. To get a feel for what Greenport is all about including things to do, dining, shopping, boat tours and more, please see my Greenport page. If you'd rather stay at a hotel check out my handy guide to Greenport Hotels. Want to visit by boat? Have a look at my guide to Greenport Marinas.